Zakończono rywalizację w grupie mistrzowskiej. Mistrzem świata w renju offline został Vladimir Sushkov z Rosji. Podium uzupełnili jego rodacy - Evgeniy Bobkov i Oleg Fedorkin. Z poślizgiem, ale w końcu ruszyły mistrzostwa świata offline. Mistrzostwa zakończone. Wyniki w załącznikach. Gacul nie zakwalifikował się do grupy A, zaś my (dein i ja) się w niej nie utrzymaliśmy. Skoro Dein się utrzymał zajmując ostatnie miejsce, czy to znaczy, że nikt nie spadał? Nie utrzymaliśmy Gracze z miejsc 7-10 spadają. Czy jest gdzieś info o walkowerach / przegranych na czas? Oficjalne wyniki na stronie RIF-u. Startuje kolejna edycja mistrzostw świata Renju offline. Zapisy potrwają do 12.03.2017, a rozgrywki ruszą tydzień później. Więcej informacji na stronie RIF-u. Mistrzostwa ruszyły 3 godziny temu. Do rywalizacji przystąpiło 54 graczy w 5 grupach, w tym gacul (grupa C) i ja (grupa B). Jeśli nic się nie zmieniło, do grupy mistrzowskiej (A) awansuje po dwóch najlepszych z naszych grup. Hello! 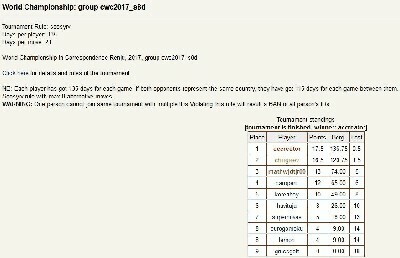 I would like to invite all renju players to take part in this year’s Correspondence World Championship. This year’s CWC will be held in 3 leagues: High League (Group A, 10 participants), First League (Groups B and C, 12 participants each), Second League (Groups D and E and so on, depending on the number of participants). The leagues and groups will be made up based on the results of 2017 CWC. High League (HL) will be created from top 5 players from the previous group A, 2 top players from each of groups B and C. One player with the highest correspondence rating but without direct right to play in HL will be added. The places are inheritable. Thus, if one of top 2 players does not sign up, his/her right to play goes to a player who achieved the 3rd place in the same group and so on. 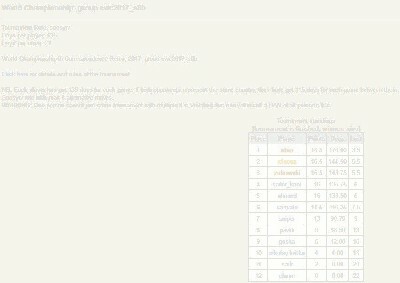 Players who achieved 6 – 10 places in group A and 3 – 8 places in group B, C as well as top 2 places from groups D, E will form the First League (groups B, C). 2 top-rated players without direct right to play in FL will be added. The places are inheritable within a group too. All other players, including new players, will form the Second League. 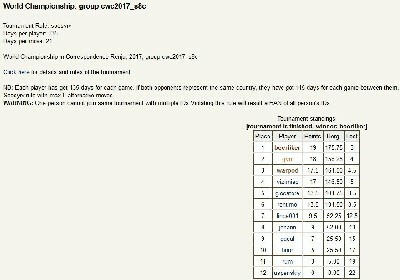 The tournament is held at Renju Offline Server (http://renjuoffline.com). Please note that this server does not support playing via e-mails, only via the interface. The opening rule for all the groups is Soosyrv-8. 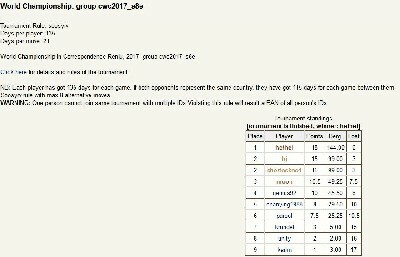 Time control is 135 days for each player and 115 days if both players represent the same country. Time control for one move is 21 days. After 150 moves a game is declared as a draw unless one player still has a sure win (in that case the player needs to contact the referee responsible for that group). If player abandons the tournament thus forfeiting a significant number of games then he may be disqualified and all his games are considered as losses. This decision will be made by the Chief Referee. NB: Dear players! Please, respect each other! Play renju according to "fair play" spirit! If Chief Referee recognizes that some player makes some "unfair" action (for example, resigns or suggests a draw in an absolutely winning position or doesn't stop an opponent's "four" etc.) to let his opponent get better tournament result, the Referee can exclude that participant from the tournament and declare all his games lost. Starting date is April 22nd, 2018. Deadline for applications is April 15th, 2018. 5. Contact person: full name and e-mail of a famous renju player who is ready to confirm your participation and proof of your identity. This person may be your club leader or player, just a good friend of you (may be from the other country). If you experience problems with finding such a person, feel free to contact the Referee to solve this problem together. Every application will be answered. If your application was not answered in a week, please try to re-send your application or connect me any in any other way such as private message via Renju Offline (userid aivo). Wyniki są dostępne na http://renju.net/media/news.php?news_no=418. 29 kwietnia ruszy kolejne CWC. Zapisy trwają do 22.04. 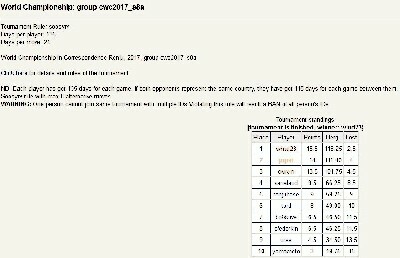 This year’s CWC will be held in 3 leagues: High League (Group A, 10 participants), First League (Groups B and C, 12 participants each), Second League (Groups D and E and so on, depending on the number of participants). The leagues and groups will be made up based on the results of 2018 CWC. High League (HL) will be created from top 5 players from the previous group A, 2 top players from each of groups B and C. One player with the highest correspondence rating but without direct right to play in HL will be added. The places are inheritable. Thus, if one of the top 2 players does not sign up, his/her right to play goes to a player who achieved the 3rd place in the same group and so on. Time control is 135 days for each player. Time control for one move is 21 days. After 150 moves a game is declared as a draw unless one player still has a sure win (in that case the player needs to contact the referee responsible for that group). If a player abandons the tournament thus forfeiting a significant number of games, then he/she may be disqualified, and all his/her games are considered as losses. This decision will be made by the Chief Referee. NB: Dear players! Please, respect each other! Play renju according to "fair play" spirit! If Chief Referee recognizes that some player makes some "unfair" action (for example, resigns or suggests a draw in an absolutely winning position or does not stop an opponent's "four" etc.) to let his/her opponent get better tournament result, the Referee can exclude that participant from the tournament and declare all his games lost. Starting date is April 29th, 2019. This person may be your club leader or player, just a good friend of you (might be from the other country). If you experience problems with finding such a person, feel free to contact the Referee to solve this problem together. Every application will be answered. If your application was not answered in a week, please try to re-send your application or contact me any in any other way such as a private message via Renju Offline (user ID: aivo).